The Hummer H1 is a four-wheel-drive utility vehicle based on the M998 Humvee, which was created by AM General. The vehicle was produced from 1992 through 2006, and was the first of what became the Hummer line. Originally designed strictly for military use, the off-road vehicle was released to the civilian market due to market demand. It was initially known as the "Hummer"; however, under a 1999 deal, GM bought marketing rights to the Hummer name and called the vehicle the Hummer H1. At the time, GM began marketing the Hummer H2 that was also assembled by AM General on a modified GMC 2500HD chassis. AM General continued to build the H1 and Humvee in its Mishawaka, Indiana facility. GM stopped marketing the H1 in 2006 model year, but AM General continued production of the military Humvee versions. Originally released in the civilian market March 14, 1992, the Hummer H1 became known from the photographs published during Operation Desert Storm and the enthusiastic campaign from actor-politician Arnold Schwarzenegger. AM General announced that 2006 would be the last model year for the Hummer H1, with production winding down in June 2006 due to a new emission law for diesel engine vehicles, which took effect in 2007. The final model year of 2006 had the most powerful engine and improved fuel efficiency—about 10 mpg‑US (24 L/100 km; 12 mpg‑imp). 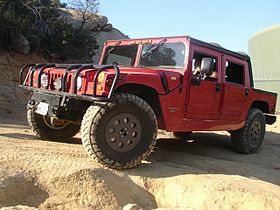 The Hummer H1 was available in three major variants: a convertible-like soft top, a four-door hard top Sport Utility Truck and an "Alpha Wagon" body version. Less known variants were a two-door pickup truck and a four-door slantback, which shares the same body style of the Humvee employed by the U.S. Military. The convertible/soft top and the station SUV versions were the last types available to individual consumers. The H1 models are inherently stable due to their wide track. They can ford 30 inches (76 cm) of water and climb a 22-inch (56 cm) step. Their stock ground clearance of 16 inches (41 cm) is made possible by tucking driveline components inside a channel in the central space between the left and right seats. They have high approach/departure angles of 72/37.5 degrees. Most H1s are equipped with a Central Tire Inflation System (CTIS), which enables the driver to increase or decrease the tire air pressure at the push of a button, since lower tire pressures are more suited for off-road, and higher tire pressures are desirable on-road. Hummer H1s have other unusual features, such as inboard brakes and portal gears that allow the drivetrain's half shafts a higher placement, for greater ground clearance. The radiator is up high, sloping over the engine on a forward-hinged hood. The air intake is high-mount, enabling the H1 to ford waist-level water. Rather than using simple runflat tires, magnesium-aluminum alloy or rubber inserts are an optional feature for runflat ability. Options included leather seats, a winch kit, and running boards. The "Alpha" was an extensively re-engineered H1 that was equipped with GM's Duramax Diesel and 5-speed Allison transmission. The previous turbo-diesel engine suffered from sluggish sales; lack of power was one of the reasons for customer resistance. In 2002, AM General CEO Jim Armour took the idea of repowering the H1 to Bob Lutz and the GM Luxury Vehicle committee. GM soon approved the use of their Duramax/Allison powertrain for the H1. This would support the continuation of the H1; it would also represent an updating in terms of power, torque, refinement and the ability to meet 2004 heavy duty EPA emissions requirements. The update program commenced in late 2002 with production launch slated to be fall of 2004. The engineering team chose the engine variant out of the GMT560 truck (the C4500) because it packaged better into the H1 engine bay; however, 23 engine component changes were required and the team had to do a 2.0 in (51 mm) body lift to accommodate the taller engine and its turbo housing (a prior 0.5 in (13 mm) lift had been done for MY96 to accommodate the turbo on the 6.5L engine). The 8th digit of the VIN is 3, setting this version of the 6.6L Duramax apart from the versions used in pickup trucks. The GMT560 engine calibration was used with minimal modification; engine output was 300 hp (220 kW) and 520 lb⋅ft (705 N⋅m) of torque. The Duramax engine was equipped with cooled exhaust gas recirculation and an internal engine oil cooler, thus, requiring a 40 percent heat rejection increase to engine coolant. Because space was limited between the air-lift brackets that protrude from the hood, the fan system was modified by putting it directly under the coolpack and driving it through a special gearbox directly off the crankshaft damper pulley. Several other cooling system modifications were required to assist with cold starting from −30 °F (−34 °C). On June 2, 2009, General Motors attempted a sale of its Hummer brand to a Chinese company, Tengzhong, as part of its bankruptcy settlement. GM stated at the time that it hoped the sale would save about 3,000 jobs in the US. On February 24, 2010, General Motors announced that the company was shutting down its Hummer brand due to Tengzhong withdrawing its bid. Tengzhong stated that the bid was withdrawn due to a failure to get approval from the Chinese government. While there is no 2005 model year Hummer H1, the 2006 model year H1 Alphas were manufactured in both 2005 and 2006. 448 H1 Alphas were produced from January through May 2005, and 281 H1 Alphas were produced from September 2005 through May 2006, when the production for the Hummer H1 officially ended. ^ "GM to discontinue original Hummer H1 model". NBC News. Associated Press. May 12, 2006. Retrieved September 12, 2017. ^ "Big, militaristic Hummer H1 on its way out". USAToday. Associated Press. May 14, 2006. Retrieved May 22, 2017. ^ "Hummer H1 Review". Edmunds.com. Retrieved 2009-09-27. ^ "Hummer H1 For Sale". duPontREGISTRY. Retrieved 2017-01-13. Wikimedia Commons has media related to Hummer H1.